Under some makeshift umbrella shades a large jovial woman had set up a perfect pyramid of string beans upon a wide metallic platter. Shatteringly green in the morning African sun. Next to her two friends were seated, going through burlap sacks of onions and unidentified root vegetables, paring off the waste bits one by one, prepping them for display. They looked to be in it for the long haul, working at a relaxed pace, ready to spend the day in a mix of selling and friendly gossip. I paused to look forward and backward down the long market avenue; I had decided to do a mid-morning walk of three or four blocks to a nearby supermarket and pharmacy, eschewing for the first time any taxis or guides during my stay. 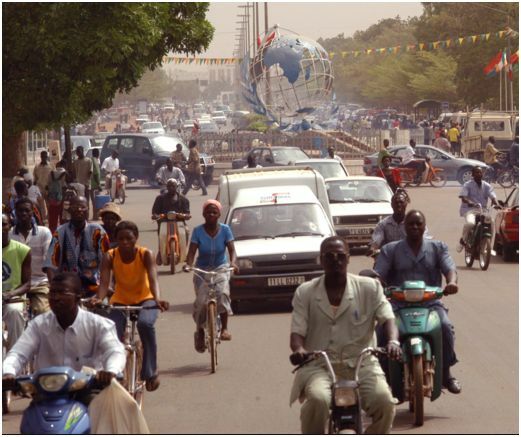 A few blocks can seem eternal in Ouagadougou on a crowded avenue during market day. It’s partly the relentless stream of unfamiliar visual stimuli arrayed along both sides of the street, and the mental strain needed to make sense of the riot of sensory data. But I tried a nighttime stroll on almost the same route a few days later, with an African friend, and it was equally disorienting in a more mysterious way. Quite dark for a city thoroughfare, the road was taken over now by pedestrians, since on all but the most avid highways cars and motor vehicles seem to evaporate from sight and earshot within an hour after sundown in Ouagadougou. I’d heard and exchanged no words, passing two blocks winding around potholes and obstacles among other evening strollers, when finally stopping briefly to look at a group of young men sitting on a blanket in front of a darkened mosque, I drew some gestures of Islamic greeting in my direction. No judgement from them, just kindly stranger protocol. The city night’s darkness had a thickness to it, a way of swallowing you into your private moving bubble of thoughts and feelings. Continuing through the market, only a few yards down the street, I came across a strange pile of things carefully laid out upon a couple of woven circular reed mats. My eyes could not figure out what they were looking at at first. Brownish striped cylinders. I soon learned this was a pile of affordable protein. Not roots or tiny tubers, but grubs, thick caterpillar-like insects which burrow under the red African soil. Must’ve been a thousand of them, lightly roasted. There was a little streetside booth with a long table filled with patterned African fabrics in every imaginable combination of bold colors. Fabrics also lined the back wall of the booth, hanging from hooks made of branches and tree roots. The proprietor modeled an outlandish garment and headpiece. Then there were towering piles of tomatoes and round beige vegetables from the countryside. A vendor across the street had laid large sheets of cardboard on the ground and meticulously swept them before placing thirty or forty clay pots of several sizes and shapes. A boy aged maybe nine or ten slowly patrolled an area balancing a large bowl piled high with eggs upon his head, occasionally calling out his sales spiel. I had to assume they were hard-boiled; there looked to be a hundred or so of them. There was also an artisan section and a brief area which seemed wise to the realization that foreign tourists happened by too, like myself. Woven conical hats from the Sahel. Soccer balls emblazoned with ‘Burkina Faso‘. Large animal sculptures made completely from motor vehicle parts, rhinos, giraffes, elephants, ibises and dragonflies. Lizards constructed of colored wires and leather. Pottery, paintings on cloth, and piles of thatched floor mats. 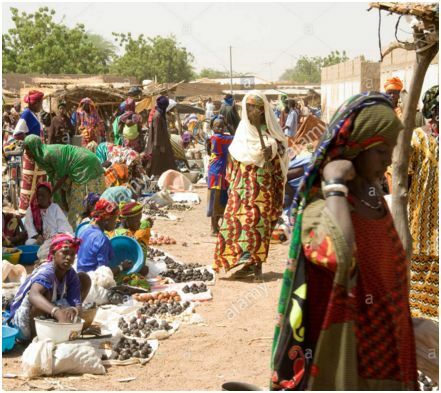 On another day, very near the same area, I had occasion to travel by car a short distance through the outdoor shopping heart of Ouaga. Only a few blocks in total, but a half-hour of driving chaos. I’m certain I could have cut my travel time by a factor of five by walking instead. Pedestrians ruled. There was no such thing as right of way. Impeccably uniformed traffic professionals with expensive looking sunglasses labored to keep the long snaking, heavily interrupted line of cars, taxis, limos and trucks connected and moving. Drivers deftly fought for progress by the foot, sometimes inches. Sometimes the opposite lane was far way, separated by a sea of people carrying or displaying every imaginable sort of object. At other times it was alarmingly close, not even permitting the side door to crack open. It was as if we were not really part of the market scene at all but just time travelling inside of it. It moved and flowed all around us, even in spite of us. Very glad I was the passenger and not the driver on this occasion. 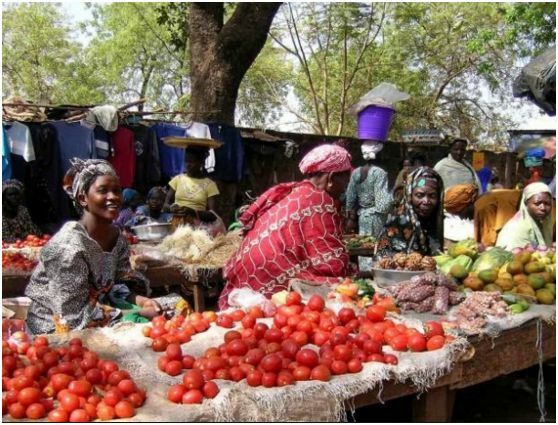 I’d heard tell of, but had no time to travel to, even funkier outdoor markets spread across the countryside of Burkina in smaller towns. Here the wares for sale and the purchaser’s needs morphed in surprising directions, influenced more specifically by one tribal group or another. 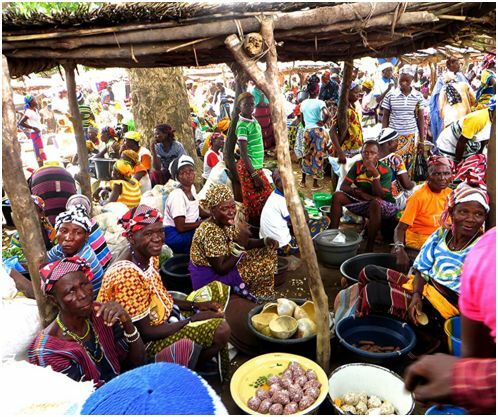 They were less cosmopolitan and more idiosyncratic than markets in Ouagadougou. To the north, it was not uncommon to see riders from the Sahel arriving at market by camel and striding deliberately through wide lanes to survey and exchange goods without descending from their steeds. To the south and west, the plant growth became more lush. There were more frequent forests dotting the landscape but also barren rocky hills. The goods, needs, and customs adjusted accordingly. I’ll leave off by mentioning some interesting related links. I’ve tried to sketch a verbal picture of Ouagadougou street life; hopefully some other sources with detailed illustrations can further rouse your interest in this fascinating part of west Africa. First, there’s Jay Dunn, an excellent National Geographic photographer who has visited the less traversed byways of Burkina Faso within the past decade. 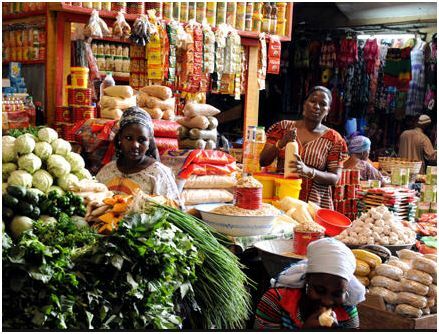 The wonderfully composed high-res image of a Thursday market in rural Gorom-Gorom below exemplifies his work. You can view these two Burkina-specific galleries on his website where many of his photographs may be purchased. 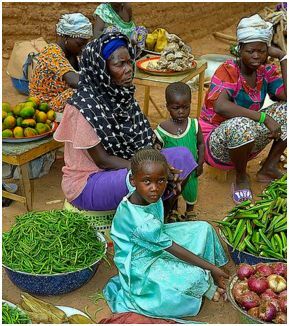 The ‘Packing Light’ blog by another travel-inclined photographer offers a series of three posts devoted to Burkina Faso which are well worth your time. Finally, please have a look at David Pace’s photojournal which offers some great glimpses of Burkinabé fabrics and apparel, a real eyeful. 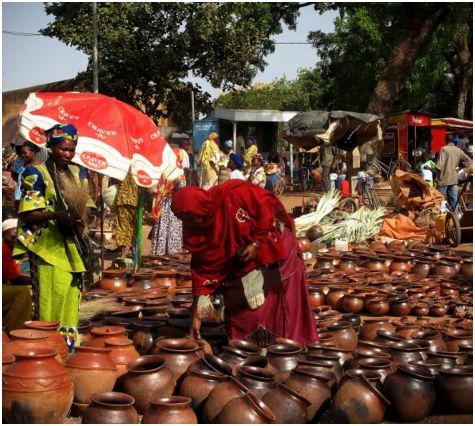 Is Ouagadougou a kid-friendly travel destination? And what about the rest of Burkina Faso, the villages and the wild countryside? I’ve likely painted a pretty hectic portrait of the place, but the residents are very welcoming. If you temper your expectations, open your heart to what you encounter, and tune your mind into west African time, you can enjoy a real family adventure here. Resourcefulness, pluck, and a talent for diminishing the distance between yourselves and the Burkinabé will carry you a long way. Here’s a neat, well-illustrated blog entry by an intrepid travelling family to give you some ideas as to what’s possible. 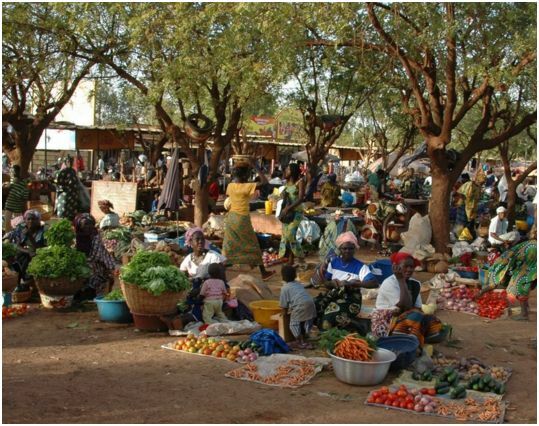 If interested, you can read another item in this little series of reflections about wonderful Ouagadougou here.